Can you even imagine being in this situation, I have always dreamed of such an experience. Well I had the good fortune of running into Tom Pisarchick of Brockway at work on Sunday afternoon. We talked a little about his great buck. 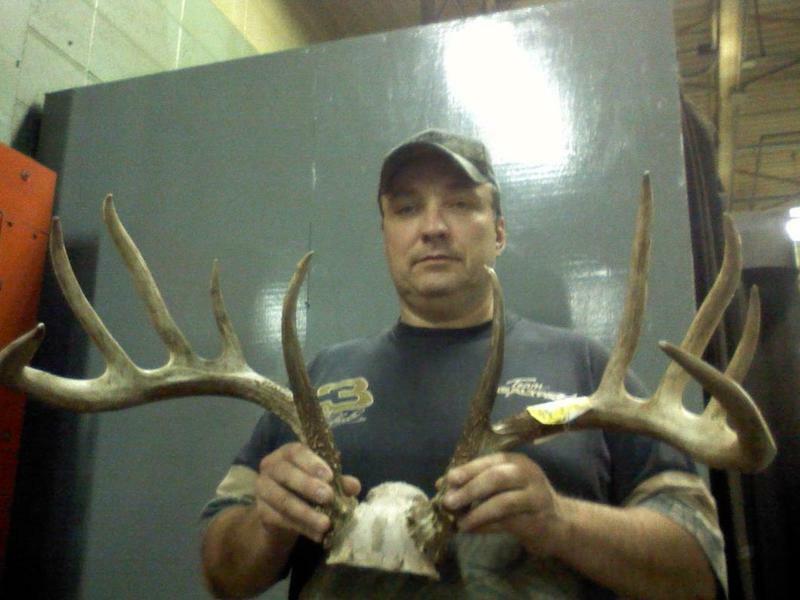 News of this Jefferson County Buck has hit the Internet and questions were being asked. I asked a few myself. I was wondering if I could have a few minutes of your day. I would like you to come and visit me at my home. There are a few things that I would love to show you. I was so happy I would get a chance to talk to him uninterrupted by customers like at work on Sunday. A phone call and arrangements to meet were made. This was the first thing that greeted me at the foot of the stairs..
Tom told me he had a troubling night at work. After talking to me at the store he checked out some of what was on the internet and was not too happy with some of the doubting comments that were out there. He assured me this was a fair chase and a legit archery buck harvest. I tried to explain that unfortunately that is the way of the Internet at times and that most of what was being posted was hear-say and second hand information and jealous deer hunter's comments. I did tell him that even I had posted some things that turned out not to be 100% true... He agreed and that was part of the reason I was there. To get more of the straight facts about this deer and his background as a hunter and true sportsman and I feel lucky that I was one of the first ones getting to do just that. He first wanted to fill me in on his love of hunting. He showed me photo albums starting in the 1940s of his family and their deer harvests and even a few turkey harvests back then. It was not hard to see that even back then there were some great bucks taken. 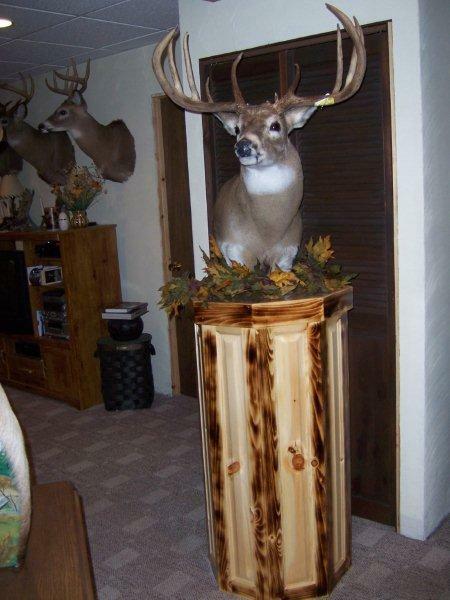 I saw several photos of "harvest poles" at their deer camp filled with bucks. Some years nice racked bucks other years some of those bucks that we have started calling "scrubs".. but the deer were there just the same. We then entered another room and this room was filled with gobblers and other turkey mounts, including a wreath of turkey feathers hanging on a wall....He grabbed a large photo album and started showing me photos of his harvested gobblers starting with his first. He has harvested 98 gobblers so far in his lifetime. 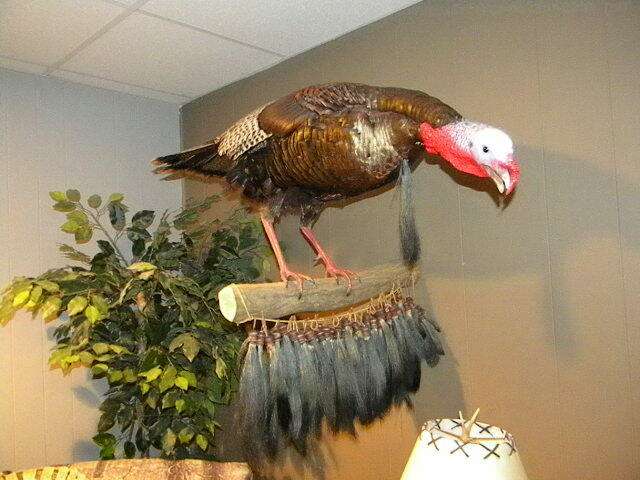 He also showed me the four "grand slam" gobblers he had mounted and in the room, grand slam = one of each breed of wild turkey. I also saw a copy of a national turkey magazine with Tom's harvest and photo featured in it. He then sat at his computer and we started talking about this year's buck harvest. 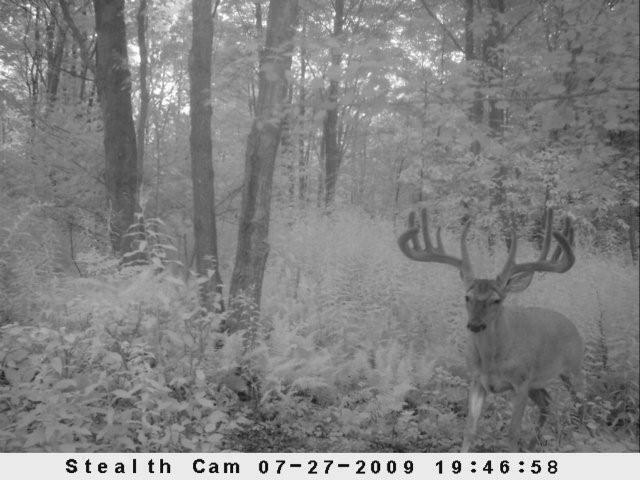 He was quick to point out he had help in harvesting this buck. What was interesting was the type of help he had.. It was Internet help from two of his friends.. One runs a guide service in New Mexico and the other a service in Wisconsin..
Tom became aware of this buck the second week of rifle season in 2008. 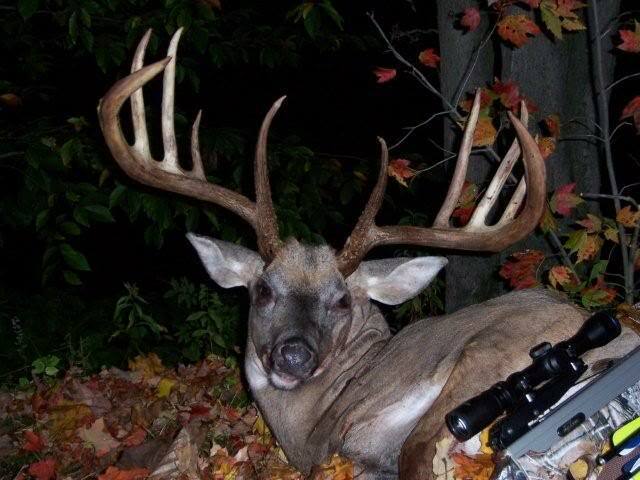 A friend had a photo that he showed him of this monster buck in his backyard. Tom was HOOKED !!! He started trying to figure out this buck's movements. 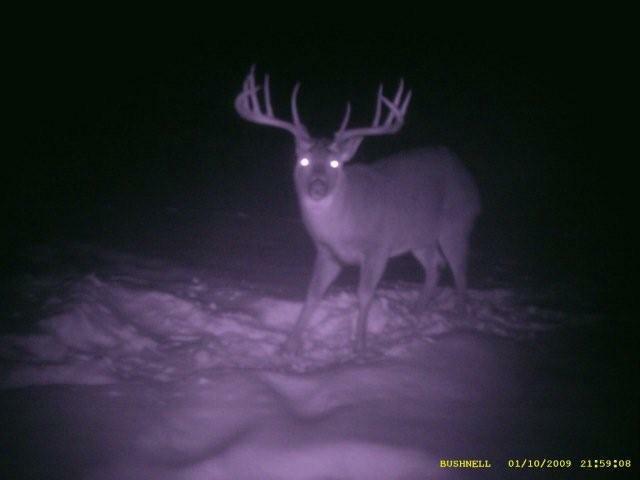 He set up trail cameras and in January started getting pictures of it. Did I say pictures ? He showed me 4 computer folders filled with trail camera photos of this buck. "I have about a thousand photos of him" Tom said as he smiled from ear to ear..
A chuckle rang out... as he told me he deleted countless pictures of all the other deer that showed up on the cameras... He clicked here, he clicked there and all I saw was pictures of the biggest buck I have ever seen... over and over again.. He explained that he started getting photos in January through March. 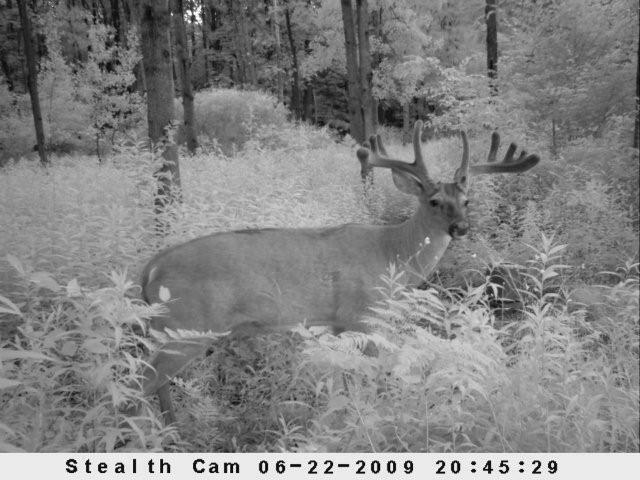 Then the deer seemed to disappear until June, then showed up again and he has photos up through August. Now this is where the help came in, since he knew these two friends "knew their deer" he would send photos and they would tell him what they thought was going on with the deer at that time of the year. He read one such E-mail to me, I must admit the E-mail spelled it out almost on a weekly basis what the deer would be doing.. and Tom said the trail cameras back up what they were telling him. 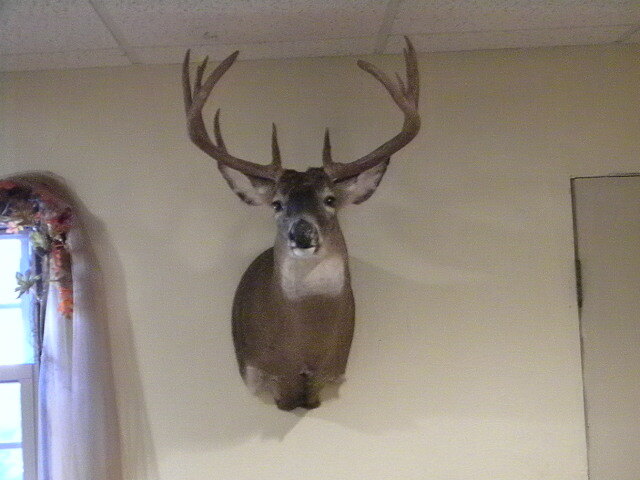 Tom shot the buck Saturday morning, he was not sure of the shot placement but knew it was a good hit. He did not want to pressure this buck and take any chance at losing him. He backed out of the woods and went home to get help. They returned later in the afternoon and found the buck. They got it out of the woods and to his home. Sunday morning at 7am, with rain in the forecast, they decided to take photos. 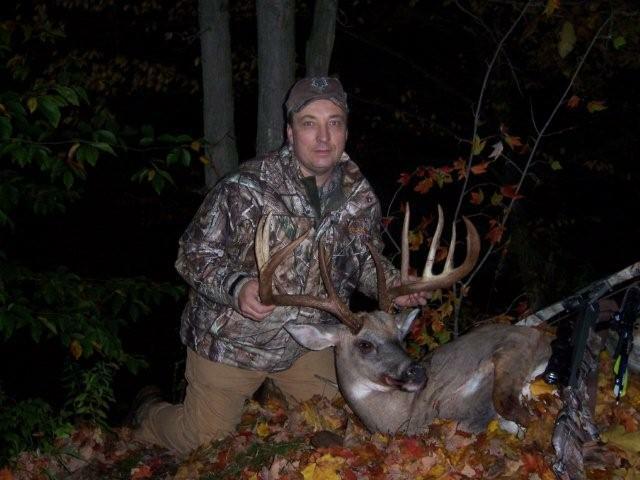 Tom has harvested many trophy bucks before so he knew that tongues and blood and the incision from field dressing were not preferred in photos. So they hid the cut with some leaves and placed the Excalibur crossbow on the deer. They also propped up the head for a few other shots. Many of the photos that show a dark background making it look like it was night, but Tom showed me other photos at the same time, in the same place, and in some of the same positions where I could see it was early morning with a much lighter background. The next few days and weeks Tom was busy getting the deer scored and contacting manufacturers to see if they were interested in his deer. 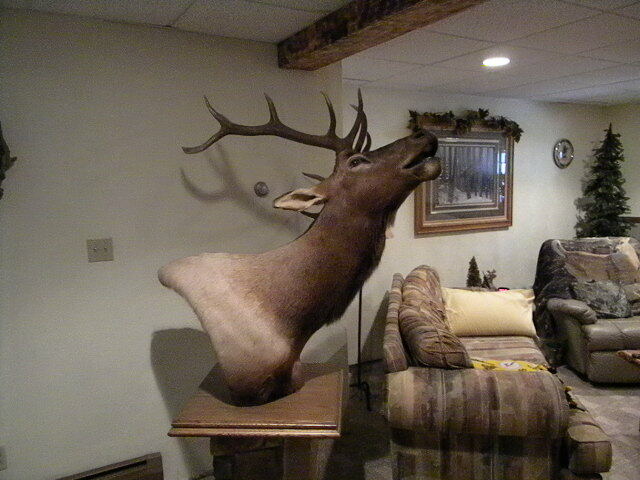 We also talked a little about all the controversy that happened about the Rompola Buck from 1998. Tom is hoping his buck will place 4th in the PGC record books for typical whitetail buck..archery..
Tom is hoping to move into that 4th place with his buck..
and after spending time with him today I hope he does.. he deserves it..
after the hard work and dedication in harvesting this buck. 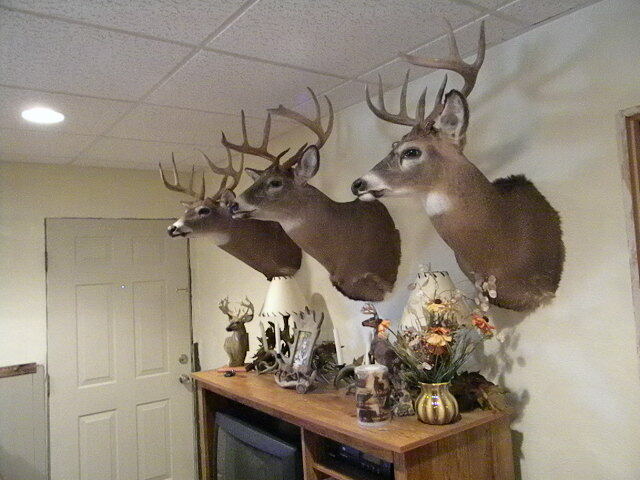 Well Tom walked across the room and started to open a duffel bag sitting in the corner of the room.. Oh, my GOD --- out comes this huge set of antlers..."here they are," Tom said with the biggest and proudest smile I have ever seen... "a couple good friends and my family are the only people to hold these but would you like too?" Well I feel pretty sure my heart has totally recovered from my surgery in 2007, my heart was racing as he placed the rack in my hands... the ends were out past my shoulders... gheez.. I did not know 28 inches was that big.. WOW.. I handed them back and thanked him.. he was still smiling from ear to ear. I said it last week and I'll say it again.. Congratulations to an avid hunter and sportsman and good luck on getting into the record books.. I have no doubts that it was a great clean ethical harvest and will bring him and his family years of great memories and enjoyment..